This car was brought to guam by a service man and stayed for about 15 years. 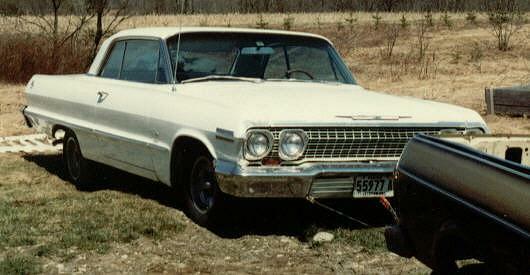 The car was eventually returned to california where my Uncle picked it up and drove it to Maine. He drove it for several years before it ended up in my dad's back yard for about a year. Then it went to my grandfathers and was stored in a garage for 4 years. It was then sold to a collector in Northern Maine who painted it red and sold it out of state. 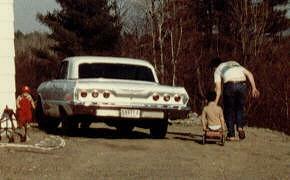 This is my dad's Brat pulling the car from our back yard. You can see my uncle beside his Vega in the shot below.